Is it a bird? Is it a plane? No it’s the ISS as it apparently flies across the surface of the Moon. This spectacular image was captured a dedicated team at ESAC on Saturday 14 January. 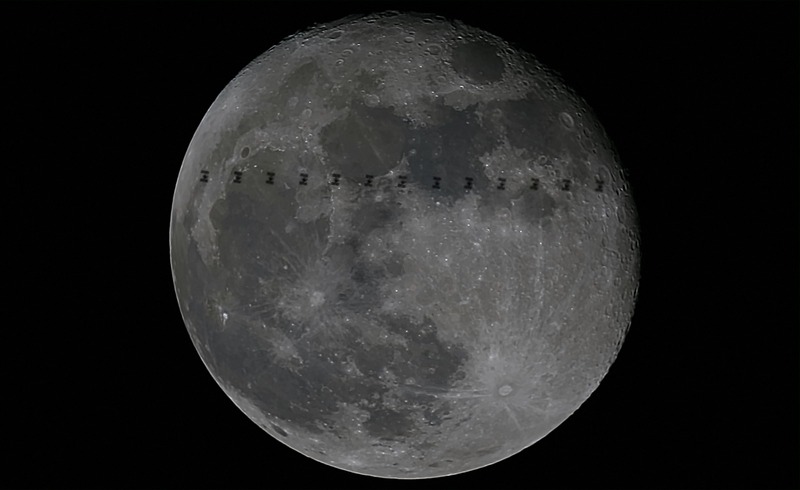 Taking advantage of the full Moon, the relative orbit of the International Space Station and the excellent night sky at ESA’s Iberian Establishment, this composite image clearly shows some of the main elements of the station’s structure. The image is a superposition of thirteen frames captured at 02:01:14 CEST. The phenomena is extremely fast: the ISS only took 0.56 seconds to cross the lunar disk. Because of this, careful planning was required to successfully record the event. ISS-Moon crossings are common, but a crossing visible from a specific location on Earth is not. The observer, the ISS and the Moon must be precisely aligned. The geometry is so particular that the ground path where observers can see the event is only a few hundred meters wide. Therefore careful planning of the observation must be performed. With all this taken into account, and considering that the ISS flies at over 27,000km/h, the transit is over in the blink of an eye.